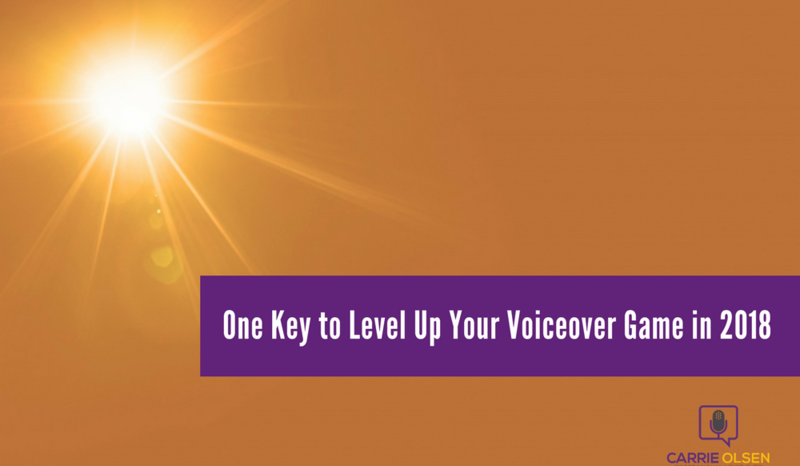 Ready to level up your #voiceover business game in 2018? Read this blog post where I share one of the keys that led to some of my biggest projects last year! Wow. Today is officially the start of 2018! And before we jump into this week’s content, let me take a second to wish you a HAPPY NEW YEAR! I want to wish you a year full of happiness, love, and prosperity. I also want to express my gratitude for letting me become a part of your voiceover journey. The beginning of each year brings so much excitement about being able to start anew, and motivates us to strive to make better versions of ourselves -- happier, healthier, and more successful. Regardless of how our previous year went, we always look forward to improving our current situation -- which is why the start of a new year and the possibilities it brings are such strong fuel for achieving our goals. Like you, I am super excited to be slayin’ my goals for 2018! I mentioned in last week's email that one of my goals for 2018 is to share more of the “behind the scenes” of my business, so if you have any questions -- if there is anything that you want to know specifically about my business or about voiceover in general, regardless of where you are in your voiceover journey -- now is the time to let me know about it because I'm planning on sharing more than I ever have before about my business. I hope that by doing this, it will give you guidance or inspiration to achieve your goals for your voiceover business. Speaking of goals, when I was thinking about my goals for 2018 -- I thought about what things in 2017 were game changers for me and my business. I looked back at some of the big jobs that I got to identify the specific things that led me to getting those booked. I figured that if I could trace back those jobs to the actions I took that helped me get them booked, I could intentionally do more of those actions this year. One of those actions really stood out to me as having led to a large amount of work. And it's not difficult to do. So, of course, I'm going to be doing a lot more this year! So this thing that led to huge success for me in 2017 is networking in person. This sounds crazy because I know that some people thrive on that. You wouldn't have to tell them "Hey you should get out more!" or "Maybe it's a good idea for you to see people in person." That's just something that comes naturally to them and that they would miss if they couldn't do it. But then there are people like me who you have to remind to get outside. Now don’t get me wrong. It’s not like I don’t like interacting with people or that it’s scary for me. It’s just not natural for me, and I can get so wrapped up in my own world that I tend to forget that I need to socialize, too. But every once in a while, if I've spent enough time inside in my booth by myself, I will start to go crazy. I'll need a break, and I'll have to run outside and see people, interact with them, and actually do life with people! In 2017, I did more in-person networking, and it has benefited my business tremendously. I can honestly trace back specific experiences, clients, and multi-thousand dollar jobs to meeting with people in person. Now while it is ideal that you network in person because that will be extremely beneficial for your business, you can also network online and have a lot of the same advantages as getting out and shaking someone's hand. Why? Because it's basically the same "muscle" that you’re exercising that you use when you network in person. So when you join a forum or a group or a community online, that counts as networking. But instead of just lurking and reading other people’s posts without actually interacting with others (nothing wrong with that; I think most of us do that when we join groups), you need to start a conversation, or ask a question, or answer someone's question, or comment on someone else's post to get the real benefit. When you network online, you can make friendships, you can meet other like-minded people, you can get ideas from other people -- all of these are beneficial for your business, as well as life in general. Plus, business-wise -- networking has the added benefit of potentially opening up job opportunities, seeing what’s working and what’s not working for other voice actors, virtually being able to rub shoulders with people who are two steps ahead of you, and also being able to reach out to those who are a step or two behind you. There are huge benefits in those. So this year, I encourage you to get outside of yourself a little bit and see what happens because there can be amazing opportunities. Get outside of your booth, or your closet, or wherever it is that you're recording, and interact and make friends. In one of my groups -- the Voiceover Success Intensive, which is one of my paid membership programs -- there are people who have joined at the very beginning in 2015 who still keep in contact with each other and they've been each other's biggest fans as they journeyed along in their voiceover business. That has been a lot of fun to see and to hear because I'm not a part of that on a daily basis, but there are a lot of instances when I hear about how those people had connected and formed long-term friendships over voiceover -- which is a really cool thing to connect over, right? One is the Voiceover Start-Up Facebook group, which is a great community. We've got over fifteen hundred people now in that group who are interested in voice over. The cool thing about this group is that it is literally people at all levels. There are people who learned about voiceover yesterday and decided to join the group, just to see what's going on. Then there are also people in that group who are full-time professionals and have been doing it for twenty years and are signed with the industry's top agents. And everything in between. The other group where you can join is the community I mentioned earlier -- the Voiceover Success Intensive -- which is a bonus group for my paid membership program. Right now, you can join for just $33 a month, and it has all of the benefits of that close-knit community I was talking about -- in addition to having a full course with hours of content that you can watch on demand and learn all about how to get started, setting up your home studio, home recording, breaking down copy, voice acting, and editing. We also cover agents, the union, how to set up your business from a legal standpoint, and all things related to running a voiceover business -- all of those subjects are addressed in the videos. Aside from the private facebook group that come with the Voiceover Success Intensive subscription, we also have monthly live Q&As and hot seat sessions -- giving you more opportunities to interact and get actual face time with other people in the group. A supportive community of people who share the same passion for voiceover at all levels -- from aspiring voice actors, to professionals who had been doing it for decades, and everyone in between. An exclusive group for the members of the Voiceover Success Intensive tribe. It comes with hours of relevant and useful content that cover all things voiceover -- from how to get started, to recording at home, to editing, to getting agents, to legally setting up a voiceover business, and more! It also provides more avenues for networking between the members with the monthly live Q&As and hot seat sessions that are a part of the Voiceover Success Intensive membership. So if you've made it a goal for yourself to get out, network more, and see other people, specifically in the voiceover community -- whether that's in person or online -- I encourage you to explore one of those two avenues. I would love to see you in one or both of those groups, and then to hear how it's benefited you. And maybe in next year's 2018 recap, you can tell me about any new opportunities or new friends that you made as a result of being a part of those communities. Below are links to both groups if you’re interested. Also, don’t forget to comment below if you have questions about my business or anything about voiceover that you’d like me to answer or share with you. Speak soon! Ready to step up your voiceover game? 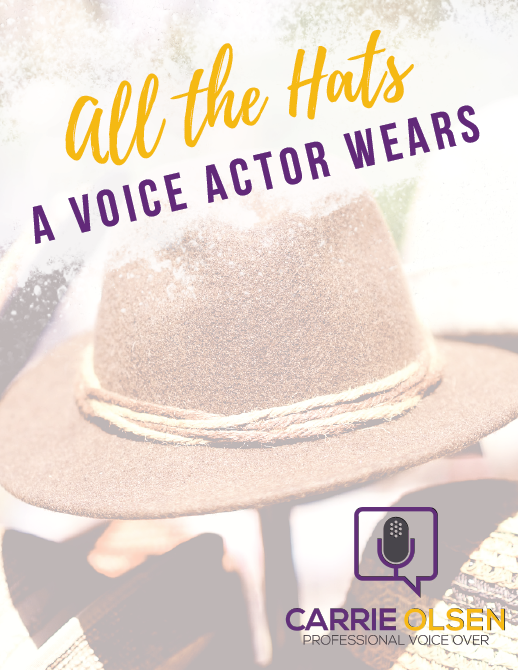 Download the "All the Hats a Voice Actor Wears" to prep and guide you on the roles that you have to take to be a successful voice actor!